If you are visibly pregnant during Christmas (only a few days away now yay! ), deciding what to wear for Christmas is probably more difficult than usual. I've been pregnant at Christmas twice myself, so I have been there, done that. Many women look naturally beautiful during their pregnancies, but the same cannot be said for most maternity clothes, unfortunately. What are the best options for Christmas, and the new year? Christmas outfit that you will probably never get to wear again, checking what you already have lying around can pay off. Of course, being comfortable during pregnancy matters more than looking great, but there is no reason you couldn't do both. 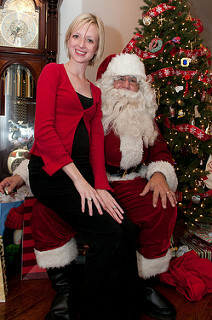 If you are feeling brave, and like Mariah Carey, you can even dress as a pregnant Santa! If you are due around Christmas, you might even end up wearing a hospital gown for Christmas. And for after the birth, you will get the chance to put those Christmas PJs you will probably get as a gift a lot more often than in previous years. Merry Christmas to you! And if you're looking for Christmas prezzies for a pregnant friend, look at our ideas for great Christmas gifts for expectant mothers. Mariah Carey Seen at Fertility Clinic- Fertility Problems?